My Two Cents On TFS Build Server Best Practices - bzzzt! Update August 2016: If you can, use the VSTS Hosted Build Service. If you can’t, then you’d be surprised to know that the Hosted Build Service uses the D2_V2. Which is 2 core, 7GB of RAM. For 1 build agent. So you know…. something to consider there…. (Update 2014: below I mention that 2GB per agent is a good starting point. This is probably not enough if you’re publishing/scripting database changes using sqlpackage.exe, particularly if one of the databases is a multipartitioned data warehouse and you plan on having multiple builds running simultaneously. I’d say 4GB, if you can afford it, per agent for this scenario). It’s amazing how important build servers are to a team working in Scrum; the team relies on a fast build server that can build and deploy code quickly. A CI Build gives the devs feedback that the code is good to be deployed to the test environment. And the testers rely that the build deploys to the environment rapidly. If it takes 10 minutes to run a CI build and 20 minutes to deploy to a test environment, that’s half hour spent on waiting to test a new feature. Over the period of a sprint, many builds are run, which leads up to a significant amount of time waiting on builds. Invariably the developers and testers whinge that the builds are taking too long, and the boss comes up and asks you to find out why they’re taking so long and speed them up. So based on my experiences here are my thoughts on how you can check that you’ve optimized your builds and build servers as much as you can. 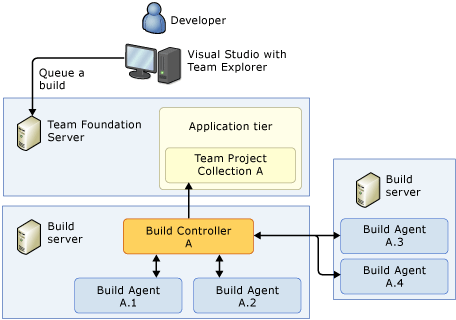 You can add more Build Agents to a Build Controller: If you have CI builds then install Build Controllers and Build Agents on a box separate from the TFS Application Tier. Create one Build Agent for every core on your server. If you find that the performance suffers from having all agents running builds, then you can disable one build agent, but it’s better to have it and not want it than to need it and not have it. Regardless of whether you use Workflow or the old .proj files, at the core of all builds MSBuild is used to compile your code. MSBuild will try to compile in parallel where it can, but you can increase the number of processes used in your build by adding the /m:n parameter (replace n with the number of processes you want to spin up for this build) to your build. now there are a number of caveats to using this: If you have followed the guideline of one Agent per core, and you set the number too high for all the builds, then you’re going to kill your servers performance. If you have lots of references to other solutions, this can caused locked dlls and consequently failed builds, plus lots of dependencies in the solutions means that MSBuild will not be able to compile many solutions in parallel, so use this wisely. Plus this gives you evidence that it’s not the build that is slow, but that the solutions needs re-configuring for faster builds. 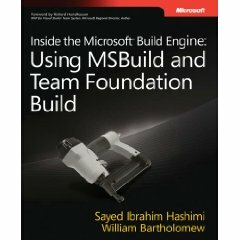 MSBuild has other parameters that can help speed up builds. I typically use these arguments: /m:1 /p:TrackFileAccess=false;BuildSolutionsInParallel=false;IncrementalBuild=false /nr:false. True. Nodes remain after the build finishes so that subsequent builds can use them (this is the default, but I am not sure why, see below). IncrementalBuild is a convenience property that sets SkipClean to true, SkipInitializeWorkspace to true, and ForceGet to false. When Team Foundation Build performs a full build, it cleans the files in the intermediate build folder and sources folder in Clean target. In an incremental build this target must be skipped because these files must be intact for the next build. To achieve this, SkipClean is set to true. As a part of a full build, Team Foundation Build deletes the old, and recreates a new workspace to clean and synchronize the source files. In an incremental build, this target must be skipped also. To achieve this, SkipInitializeWorkspace is set to true. In the Get task, Team Foundation Build by default retrieves new source files and overwrites the existing files in the build workspace. To only retrieve the changed files, the property ForceGet is set to false. I strongly urge you to try each potential time saving setting out individually on your builds as they are far from perfect; as I mentioned, if you have many dependencies, building solutions in parallel can cause lots of locking dlls. If you only have a four core machine, and you have an agent per core, and you set the /m switch too high, you can negatively impact performance greatly. So there you have it, unsurprisingly the most important thing is to have a super fast server with fast network access and a well designed set of solutions that don’t have many inter-dependencies, and these things are probably out of your control. But if you do experiment with the flags and cloaking, and making sure that you’re not overloading your servers with activities it just can’t cope with, you might be pleasantly surprised by just how fast your builds increase.